Weather Info (monthly averages) Max Temperature: C / F Min Temperature: C / F The above data in our Weather Info table are temperature predictions for the date of the medical event for MUSCAT, Oman. On behalf of the Organising Committee I'm delegated to invite you all to attend the 20th Annual National Conference of Otolaryngology & Head & Neck Surgeons of Oman to be held in Muscat, Sultanate of Oman from 10 - 11 November 2017. This year, we are joining forces with the 10th GCC ORL H&N Society Symposium to present you an international conference which covers all aspects of ORL, ENT and Audiology. We believe this event is an important platform to share the latest updates and excellent opportunity to meet and network with local, regional and international faculty which gives you added value to your relevant daily practice. You will also of course have the opportunity to experience Muscat which is considered the pulsating heart of Oman where visitors can view the wonderful variety of nature: golden beaches, mountainous heights, and golden sand dunes. Perhaps what is striking about Muscat Governorate and its states is the breathtaking intermingling of ancient cultural heritage and modern style. 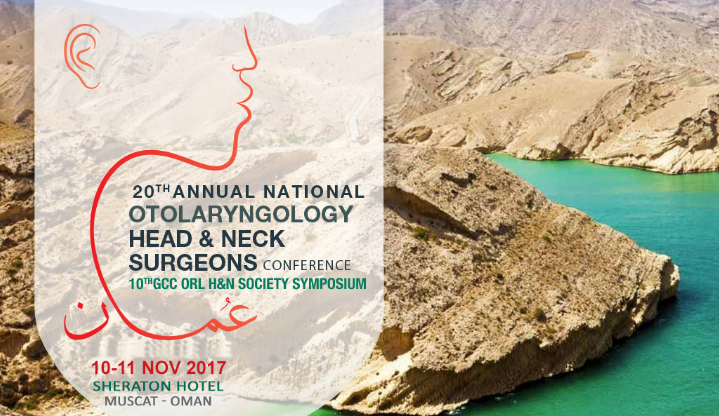 With your attendance we trust the "20th Annual National Conference of Otolaryngology & Head & Neck Surgeons of Oman" will be a successful one. Sheraton Oman Hotel is a landmark in the city of Muscat and has been a synonym for 5-star hospitality for over 3 decades. Located on top of Ruwi, the financial and business district of Muscat, the hotel is the tallest building in the city and has long been a part of the social fabric of the local community. All abstracts must be submitted in English using the online submission link on the website. Corresponding authors must provide the organizers with their full mailing address, office hours phone number, fax number and email address. Author and co-author information must be provided including the first and last names of all authors, their department, institution/ hospital, city, state if applicable and country. Abstracts must contain original scientific data collected by the author(s). All abstracts will be reviewed by the Scientific Committee. The Scientific Committee reserves the right to determine whether a submission is accepted as an oral, video or a poster presentation and its decision is final. The Scientific Committee reserves the right to edit abstracts for grammar and clarity. The abstract may be scheduled for presentation on any day from 10-11 November, 2017. Abstract Title: The title must be brief, concise, and in CAPITAL LETTERS. Authors: Please enter your name and your colleagues' names as you wish them to appear in the Final Program. Maximum number of words: The abstract text should have a minimum of 250 words and maximum of 300 words only. Abstracts accepted as oral presentations will be given 15 minutes of presentation, including three minutes for question and answer session. Presenters will be requested to submit their PowerPoint presentations saved on a CD, DVD or memory sticks (using the USB port in the computer) and uploaded in the Speakers' Ready Room at least two hours before the start of your session. If you have a video embedded on your PowerPoint presentation, please check that the video file works properly in the hall where your presentation is taking place during a break immediately prior to your session even after you checked in in the Speakers' Ready Room. The meeting rooms will be equipped with PC - based laptops. Use these fonts as other fonts may change to a default font on a PowerPoint-based PC: Arial; Times New Roman, Verdana. Insert photos that are JPG files. Please note that images saved as TIF, PNG or PICT will not be visible on a PowerPoint-based PC. Use AVI, MPG and WMV files as MOV files from QuickTime will not be visible on a PowerPoint-based PC. Display boards for poster exhibition will be provided on-site. Please prepare your A0 (118.9 cm x 84.1 cm) size poster in PORTRAIT layout. You are required to develop, print, and bring along the poster to the venue for mounting onto the poster board. For legibility, a minimum font size of 28 points and a maximum of 600 words on each poster are recommended. Double-sided tape will be provided to mount your poster. * If you have any problem submitting your abstract through the online system, please contact the Secretariat at omanorl@mci-group.com for assistance.